Aaron Hernandez is looking to have his personal cell phone, and all text messages and evidence found on it, thrown out of the Odin Lloyd murder trial. Attorneys for the former Patriots tight end says that police did not have the proper authority or search warrant to take his cell phone from their law office, only from Hernandez's North Attleboro, Massachusetts, home. The defense team says that Massachusetts State Police should have returned to the clerk's office to get a new search warrant before seizing the phone. 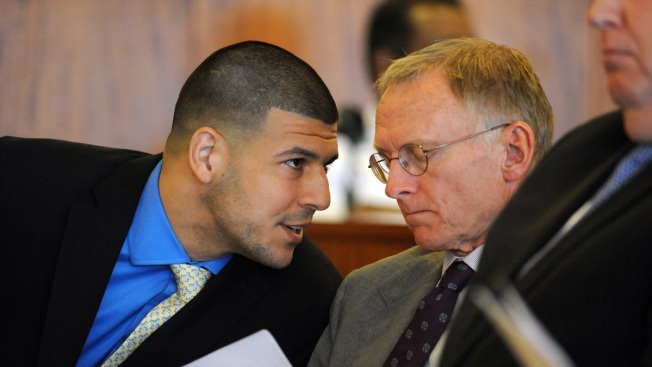 "The defense in this case is trying to exclude the cell phone of Aaron Hernandez by alleging that the government mislead Aaron Hernandez's lawyer Michael Fee into giving them the cell phone even though they didn't have the authority to seize it," NECN legal analyst Randy Chapman said. "This motion as compared to any other motion goes to the heart of the government’s case. If the defense is successful in excluding evidence, it will have a very devastating effect on the government's case." Bristol County Prosecutors had no comment citing the ongoing gag order, but will file a written response sometime soon. Just recently, the judge threw out cell phones and iPads from the same trial. Hernandez has pleaded not guilty to Lloyd's 2013 murder. He has also pleaded not guilty to the 2012 double murder of Daniel de Abreu and Safiro Furtado in Boston.